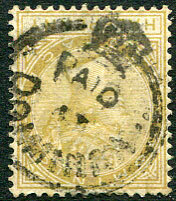 on 1883 QV ½d olive-yellow CA wmk (SG.13). on reg. OHMS piece dated Nassau 13 FE 52. 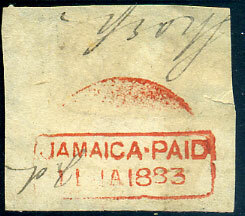 (PD14) in red dated 11 JA 1883 on stampless envelope piece. Crowned Circle on QV 1d lilac CC wmk (SG.5). 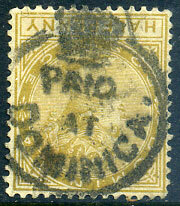 Crowned Circle on QV 1d CC wmk (SG.5), thin. 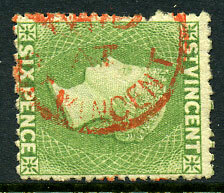 large part strike in red ink on 1877 QV 6d pale green (SG.23), perf. fault at top left but very rare on this issue. Ex BECKER (see display BWISC website).